Heidi Elnora is all about defying expectations. Most people wouldn’t expect a wedding dress designer to achieve fame out of Birmingham, but Elnora has. Most people also wouldn’t expect a designer who specializes in couture gowns to live in the middle of a hayfield, but again, Elnora is full of surprises. Elnora, who is from Morris, said she’s always known she wanted to be a designer. She describes design as something that’s in her blood. Elnora received a scholarship to the Savannah College of Art of Art and Design, where she honed her craft, she said. After college, Elnora abruptly returned to Birmingham after being injured in a car accident. While recuperating, she called Alabama Wedding Magazine. 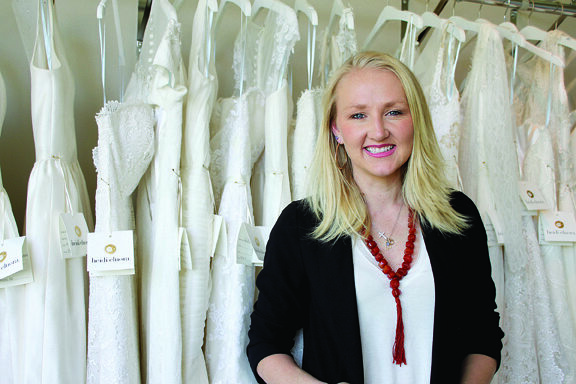 “I said ‘Hi, I’m Heidi Elnora, and I want to design a wedding dress,’” Elnora said. Elnora credits her attraction to the wedding niche to her desire to create something special and cherished. Elnora founded her company in 2006. Since then, she has been featured in New York Bridal Fashion Week, sold dresses in stores such as Nordstrom, been a contestant on TLC’s Project Runway and has become a mother to two little boys. She also founded Birmingham Fashion Week in 2012 and last month starred in her own reality show on TLC, “Bride By Design.” She still has an atelier at Pepper Place in Birmingham where she regularly meets with clients. In October 2014, Elnora defined her brand into three separate lines — Build-a-Bride, Hello Darling and heidi elnora. Each brand targets different price points and aesthetics for different types of brides, she said. Despite her fame as a designer and reality show star, Elnora said she doesn’t feel she’s changed. Family members have commented on how true to her personality she stays even while being filmed, she said. Elnora is tightlipped about the future except for saying she’s constantly looking for ways to grow. She is already planning a new line that will be released in October and is also always looking for ways to expand Birmingham Fashion Week as well as her company and creating new fashion job opportunities in Birmingham. And when it all gets to be too much? For more information on Elnora’s designs, visit www.heidielnora.com.